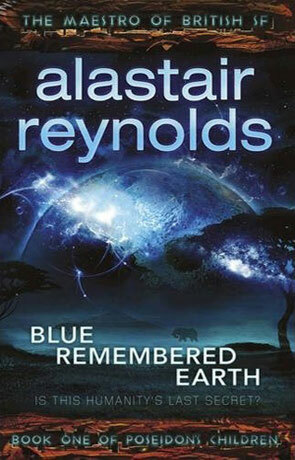 There are very few authors alive today that can quite match Alastair Reynolds vision of future space and Blue Remembered Earth is the beginning of possibly his most ambitious future vision yet. At the same time it's also one that also feels much closer to home than any novel he has written before. The story is set one hundred and fifty years in the future, a future where wars, global warming and other crises have allowed Africa to emerge as the dominant technological and economic super-power. While many recent novels have shown a bleak and dark dystopian future of humanities struggles and descent into anarchy, here Reynolds paints a much more optimistic future - a utopia where crime, war, disease and even poverty have been all but eradicated. A world where most of humanity is intelligently connected to a vast digital grid, that protects, tracks and improves the lives of each and every citizen on earth. This is a world where everything is overseen, a place where crime is detected pretty much before it's attempted and nothing is missed (although there are allusions to impossible crimes). This all seeing eye doesn't however extend to some of the many colonies located in other parts of the populated solar system (mainly due to time lag restrictions). Geoffrey Akinya is a member of one of the wealthiest families on the planet and it could be said that should he want to he could enjoy the luxury and power that only the few super-rich can. He and his sister Sunday however don't toe the family line, rebelling against the stifling oppression of their personal freedoms and choosing to pursue their own lives outside of the family business. All Geoffrey wants is to be left alone and in peace so that he can continue his studies into the elephants of the Amboseli basin. However after the family matriarch dies (Geoffrey's grandmother Eunice) Geoffrey is blackmailed into heading to the Moon and retrieving and object that Eunice had kept, something that is suspected by his scheming cousins could prove awkward to the family if made public. In reality though what is about to be uncovered has much deeper implications than anyone could possibly realise with the power to tear this utopia wide apart. One of the things I like most about this book is the way that technology is handled, rather than give lengthy exposition on the why's and how's, everything is simply described by it's very function and you can easily grasp how such a device could work without worrying about the technical aspects. All this future tech feels so plausible too. Everyone has a mandatory amount of personal technology that allows communication, recording and functioning as an augmented reality but it's handled in such a way that feels totally natural and intuitive. In this future technology finally works for the user rather than the user having to adapt to the technology, blink your eyes to take a picture, open a ching to speak to someone or get an information overlay about anything you see. It's also a nice change to some of his "harder" science fiction novels and shows his range as an author. The characters are pretty special too, very well developed, decidedly human and easy to relate to, which extends to the more minor characters of the book too. The story itself essentially revolves around this hunt to find out just what it was Eunice decided to hide which eventually leads to the big reveal of the book - and when I say big I do mean BIG. The path taken to that point in the story is both winding and intriguing in equal measures, a chase that is quite enjoyable as much for the journey as the end prize. It is worth noting that this is but the beginning of a journey that promises to span eleven thousand years over the next two novels. I loved this optimistic feel to the whole book, a nice breath of fresh air from all the post-apocalyptic and dystopia (although I do like those genres) and it's a credit to the author that he had the insight to use this perspective to such great effect. Full of great ideas, interesting characters and above all a strong story, Blue Remembered Earth is an exceptional novel from one of the leaders of the genre, unmissable. Written on 1st February 2012 by Ant.